Deputies were called to the 25000 block of Tomey Court Wednesday after one of Mala Manwani's co-workers at CSRA — where she was an accountant — reported that no one had heard from her since Monday afternoon. When deputies checked the home Wednesday, they found Manwani, 65, and her son, 32-year-old Rishi Manwani, dead in different parts of the home, which is across the street from a school bus stop. Both had been shot more than once. "It's terrifying," said neighbor Sarah Hayes. "I'm so sad for them and scared for my family and for my neighborhood." The deaths are being investigated as a double homicide. Authorities do not believe it was a random act and say there is no indication of any threat to the public. "We suspect it was related to potentially criminal activity that was going on in the resident, which is why we're not concerned this is anything other than a targeted set of murders here," Sheriff Mike Chapman said. 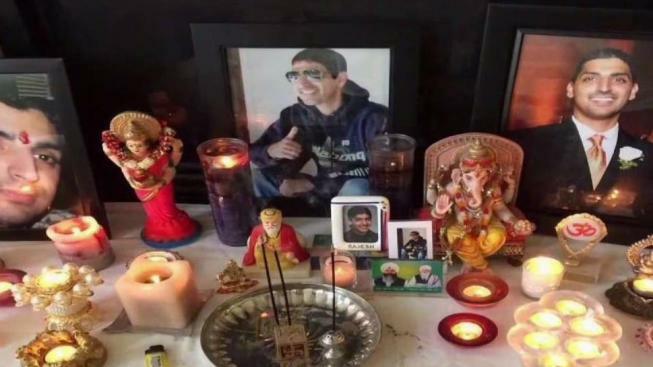 A friend of Rishi Manwani said his older brother, Raj Manwani, died of a heroin overdose two years ago, which the medical examiner's office confirmed. The friend said Rishi was known to use drugs, too. Over the weekend, neighbors reported seeing a suspicious can driving up and down the deadend street and gave the license plate number to police. CSRA released a statement saying, "We mourn the stunning loss of Mala Manwani. Mala was known as a kind and dedicated employee by everyone who worked with her." Rishi Manwani had worked as an IT specialist for Amazon.